I am looking for a first name for my baby boy, who's due in March. His last name is Drake. I'd like something Victorian and old school. Something both Victorian AND old school--a tough assignment. In anticipation of the arrival of your long-awaited young gentleman, I bequeath unto you Horatio Drake. 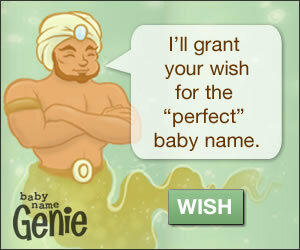 Okay Mr. Baby Name Genie, I'm in desperate need of your help! We are expecting twin boys, and we need two perfect names that aren't too "American," like Hudson or Riker, as we're from England and they just sound tacky over here. But they should not be too English like Graham or Oliver, either. Haha, we're very picky! Oh please. Mr. Baby Name Genie was my father. Just call me Powerful and Most Wise Genie. That's what all my friends call me. For your twin boys, I give you Jeremy and Tomlin; a bit of British prim and proper with just the right amount of American tackiness. My sister is expecting her third - a little girl and has given me the task of naming her. I am really battling to find a name beginning with a T as her siblings' names are Tatum and Trent. Please help? For a name that will fit your little niece to a tee, I grant you the name Tatiana. We are having our third boy. Our other two are named Jackson and Houston. We aren't really committed to another city name. Yet we aren't totally traditional. Any suggestions? Jackson and Houston were named after people, so they aren't purely city names. After eliminating Salt Lake City, Ephesus, and Radiator Springs as names for your third boy, I've decided to give you Austin. I've always loved the name Vivien for a girl, but I married a man with the last name of Villarreal. Vivien Villarreal just sounds a little too alliterative for my taste. I want a feminine and elegant name for my daughter that isn't overwhelmingly popular. Do you think Evelyn Leigh Villarreal is a good choice, or do you have another suggestion? Verily, Vivien is a virtuous and valorous title, yet the vicissitudes of Fate have intervened to vex your volition with Villarreal. The verdict is that a violation of "v"s is more vice than virtue. Before I vanish, allow me to vouchsafe that Evelyn Joyce would be my vote cast vicariously, hopefully not in vain. Hi my name is Jordan Flores (translated to Flowers in English). I'm looking for both a boy's and a girl's name that works with both English and Spanish cultures and flows with my last name. Please help! I hope to sprout a name that is a beautiful bouquet for your budding son or daughter. The root of a good name stems from a nice arrangement of sounds. For a boy, give Marco Flores a try. For a girl, I give you Gabriella Flores. So, I want a beautiful girl's name that comes from a well-known book. I'm open for creative names, but I won't name my daughter Katniss! While Esther is a darling name that comes from the world's best-known book, try the beautiful Cosette from Victor Hugo's uplifting and inspiring tome Les Misérables. I have a big dilemma: I want to name my daughter Ariel but my last name is Fishman. Also, I have two other daughters--both redheads with huge eyes. I'm worried about her getting made fun of. Some people say it's perfect and others say it's too much. So, I was thinking about the name Avril instead? I need some advice. Now, that is a whale of a tale. While some may find Ariel a little fishy and carp about you floundering around with naming her, others will find your scaly princess to be a bit of a fish out of water. As long as you can take a little sea-horsing around, name her Ariel and see if others take the bait. You have such fantastic naming insight that we wanted to consult your expertise. We have decided on names inspired by our love of travel. We found out we were pregnant in England! If we have a girl, her name would be "Sydney Rose Speck," and for a boy, "Miles Jameson Speck." Is the alliteration with "Sydney Speck" too repetitive? Does "Miles Speck" blend too much? (middle names are family names) Thank you for your words of wisdom! Since you are so fond of travel, might I suggest the following names for your consideration: Layover Lucy Speck, Lost Luggage Speck, Undrinkable Water Speck, Somali Pirates Speck. You don't like these? Fine. Then, I would suggest dropping Sydney for a more apropos name: London Rose Speck. For a boy, Miles Jameson Speck is a great travel name. Hello! I hope you can help us--cuz no one else can! We have been blessed with a baby GIRL!! Thank goodness! We have a son, aged 4, named Aaron Timothy Sheldon. We really love Chloe--but we're concerned it's way too popular compared to Aaron. What do you think, oh genius genie? If you think it's ok, what's your best suggestion for a middle name? So far we like Amelia and Anneliese with Chloe. If not, PLEASE suggest names!! Thanks! You're amazing!!!! -Your #1 Fans!! So nice to hear from my #1 fans. Fans #2-#10 never seem to write. Both Chloe and Aaron rank in the top 50 for baby names for their gender, so Aaron is a good match with Chloe. For a middle name for your popular daughter, I give you Chloe Olivia.